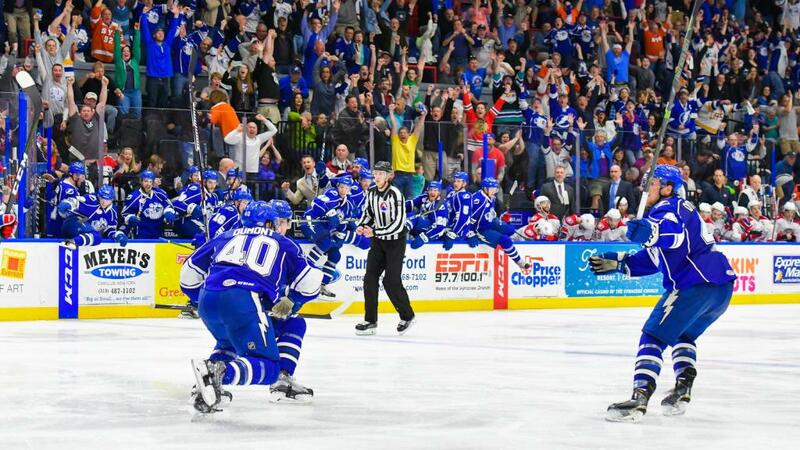 Celebrate 25 Years with the Syracuse Crunch! On Saturday, Oct. 13, the Syracuse Crunch will host their 25th Home Opener presented by Upstate University Hospital when the team hosts the Charlotte Checkers on Saturday, Oct. 13 at 7 p.m. The 25th Home Opener on Oct. 13 will be highlighted by an opening ceremony featuring one former Crunch player from each of the team’s affiliations – Reggie Savage from the Vancouver Canucks era, former Crunch captain David Ling from the Columbus Blue Jackets era, Jon Mirasty from the Anaheim Ducks era and former Crunch captain Mike Angelidis from Tampa Bay Lightning era. Each player will be accompanied out by the mascot from that affiliation. Additional special guests will include former Onondaga County Executive Nicholas J. Pirro and Ryan McMahon, current chairman of the Onondaga County Legislature and successor to Joanie Mahoney as County Executive. The Crunch will also recreate elements from the team’s inaugural 1994 home opener. Following 2018-19 player introductions, the Crunch will begin the 25th season celebration with an opening video on the brand-new state-of-the-art scoreboard and ribbons lights looking back on the franchise’s history. During the game, the team will wear silver specialty jerseys to commemorate 25 seasons in downtown Syracuse. Additionally, the first 2,500 fans in attendance on Oct. 13 will receive LED foam batons, courtesy of Upstate University Hospital. The Crunch came to Syracuse for their inaugural season in 1994-95. The first game was held on Sept. 30, 1994 against the Albany River Rats. Since then, the franchise has hosted some of the most notable games in American Hockey League history. On Feb. 20, 2010, the Crunch held the Mirabito Outdoor Classic, the league’s first-ever outdoor game, at the Grandstand at the New York State Fairgrounds. The game set an attendance record with 21,508 fans. The team set another hockey benchmark on Nov. 22, 2014 when the Crunch to hosted the first hockey game in Syracuse University&apos;s Carrier Dome as part of the Toyota Frozen Dome Classic. The game set an American indoor attendance record with 30,715 fans. Along with record-setting events, the Crunch have previously hosted the AHL All-Star Classic in 1998 and 2016. Both events brought the top young talent in the AHL to Syracuse to help showcase the league. Tickets for the Oct. 13 Home Opener presented by Upstate University Hospital are still available online through www.syracusecrunch.com, over the phone at 315-473-4444.